There is one thing that as miniature wargamers we cannot get away from – we all need terrain over which to fight. Luckily, we seem to be in a golden age for terrain. Gone are the days when we were forced to scratch build our battlefields from old soda cans and sticky-backed plastic – most of what we may want or need is available from one of several outlets. I am taking part in the next Warring States Campaign Day in March, and at some point (obviously in a fit of enthusiasm) I offered to create one of the terrain tables. I have decided that I’m going to create a walled temple compound – it will be a great complex for my recently painted Ninja to attack! I have several buildings already, but still need some smaller shrines and paraphernalia, plus the walls themselves. 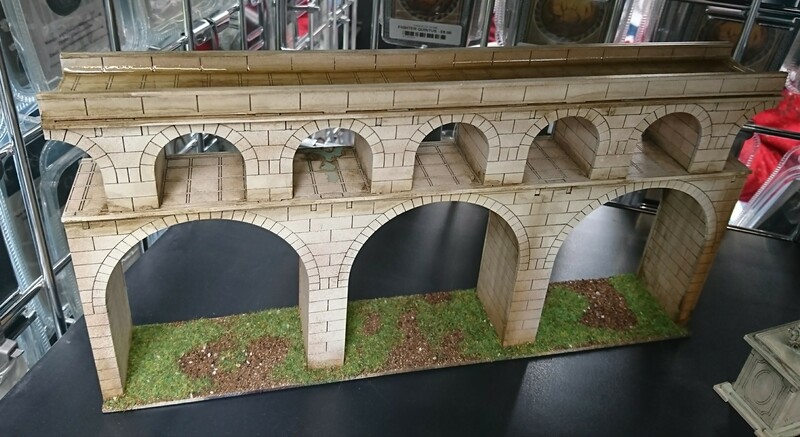 After a quick bit of Google-Fu, I’ve decided on getting the walls from Blotz (they also do a very nice Shinto Shrine) and other accessories from TTCombat. I’ll probably also pick up some graves from Oshiro Model Terrain. Given that the event is in four weeks time, I’ve got to get my skates on with this one! The Forager skirmish rules have a very low model count. but you still need a decent sized battle field with some buildings over which to do battle. You need enough buildings for a (very) small village, so I’ve been looking around for something suitable. Whilst I was having a bit of a sort out last week, I came across this little gem – Touching History, Volume 1 – somewhat battered but hugely useful. It’s just the sort of publication you need when thinking about Forager, so I will be taking some of my inspiration from this. However, I won’t be starting completely from scratch, but using the Modular Building Range from Warbases as the foundation for some modelling. I can basically purchase an entire village for the cost of a single pre-assembled building, so it’s almost a no-brainer. Besides, I do actually like making terrain. I’m hoping to get the buildings at Hammerhead in a few weeks, with the aim to be ready to play by the summer. This is the one that has sneaked up on me a little bit. There is no doubt that the major expense in this game is creating Rome – something that Sarissa Precision has made very easy to do – although populating even a 3′ x 3′ table is a not insubstantial cost. I resorted to playing around with bits of cut-out paper on a 9cm x 9cm ‘board’, so everything is cut out at 1/10 scale, just to give me an idea of how all the buildings could fit together. It’s a bit messy, but I sort of know where everything fits – the plan also leaves two areas for market stalls/slave market and/or fountains and monuments. The only issue here is cost, as this layout looks to need about £250 of buildings – so it’s something that will be built up over the space of several months (pardon the pun). All I need now is some time without any major distractions – but we don’t have any major new miniature games being released in the next few weeks, do we? Which buildings are in the next to last last picture? I have been looking for them at Sarissa Precision. Like you I have been inspired by Touching History Vol 1 (a bargain at a number of shows as it has sadly been remaindered) for Peninsular buildings. I have made some Warbase properties, adding sand to the walls to give texture and using railway modelling pantile roofs with bamboo skewer ridge tiles. They look very much the part. I have also moved on a little and used foamboard where the author used mdf (just cut it with a sharp craft knife rather than a jigsaw) and added a mix of Warbase doors and windows and others by railway modelling companies. Again they have been enhanced with sand on the walls for texture and to hide the joints and plastic pantile roofing. I am not a skilled builder but I found the whole process pretty easy and the end results look pretty good (people have asked who makes these models!). Also, it is not terribly time consuming. So I suggest you have a go – saves a fortune on commercial buildings.